Artist Anne Doris-Eisner captures the forces of nature, and its warmth, with dramatic interpretations in black and white.“Primal Forces, in Black and White”, opens at New Canaan Library’s H. Pelham Curtis Gallery on Thursday, April 25 and runs through Sunday, June 2, 2019. An opening reception will be held on Saturday, April 27 from 3 - 5 p.m.; a Q & A with the artist will begin at 3:30 p.m. All are welcome to attend. Doris-Eisner works almost exclusively on paper because of the immediacy and physicality of that medium. 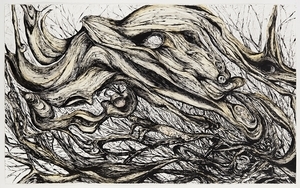 Her work depicts and echoes the struggles and resilience of the natural world: a tree in its growth and decay, revealing strength; a rock strata reflecting the power of upheaval and renewal; water in its destructive and life-giving forms. Her unique technique is part of her creative process. Most often using non-traditional tools found in nature, such as feather, twig and bone, she paints, scrapes, and repaints to capture the resilience and beauty of the natural world and its expression of the human capacity for resilience, defiance and renewal.